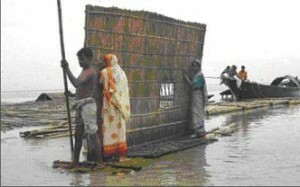 August 3, 2007: Flood-affected people of their homes and move to higher grounds yesterday as the flood situation in the district worsens. Sunday, August 12, 2007 – BRANTFORD, CANADA – CMAT will deploy a 2-member assessment team to meet its local partner in Dhaka this week. As part of their initial 3-4 day assessment they will make a determination as to whether the Canadian Medical Assistance Team (CMAT) field hospital will be deployed or not. 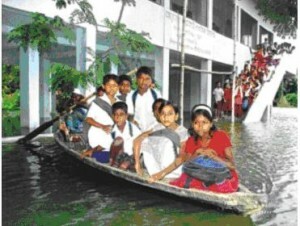 August 3, 2007: Students of Arakul Primary School use boats for transport to and from the school as floodwater has inundated the locality. A initial ten-member medical team consisting of physicians, nurses and a water treatment engineer is being assembled and will be on standby for deployment. If the field hospital is deployed it will be for a four week mission to treat water borne illness, diarrhea, dehydration and trauma. 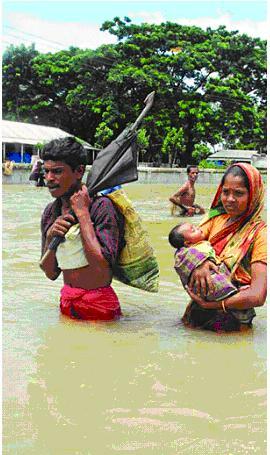 August 3, 2007: A couple with their baby moves to a safe place, wading through flood water. CMAT appeals to its supporters for generous donations to help the people of Bangladesh.